Clyde »Skip« Battins navn er for alltid forbundet med countryrockens aller fremste band. Battin, som døde i 2003, 69 år gammel spilte bass og sang med The Byrds, New Riders of the Purple Sage og The Flying Burrito Brothers. I 1972 slapp han sitt, så langt, eneste soloalbum, »Skip«. Nå slipper Sierra Records det som skulle ha vært oppfølgeren, »Topanga Skyline«. Sierra Records is proud to announce the new release, »SKIP BATTIN: TOPANGA SKYLINE« in late November, 2009. 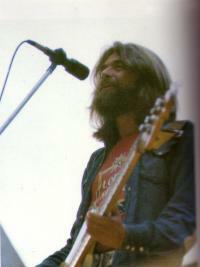 Exactly 40 years ago, Skip Battin made his first concert appearance as a member of the Byrds at Carl Edward King Memorial Gymnasium, Morris Harvey University, Charleston West Virginia! This was to be Skip's second solo album, recorded in late July 1973, just days after the tragic death of Clarence White. Produced by the legendary Kim Fowley, it would include backup for the most part by the Country Gazette (Byron Berline, Roger Bush, Alan Munde and Roland White) along with Al Perkins. The album unfortunately never saw the light of day, until now. Taken from the original master audio tapes, each song (mostly Battin/Fowley originals) is as sharp and pointed as ever. Just wait until you hear Skip's bluegrass version of »Hully Gully«, the old 1959 »Olympics« rock and roll classic. With the help of the Country Gazette's bluegrass chops, this album's sound could have predated Leon Russell's »Hank Wilson's Back« effort. »Topanga Skyline« also boasts some additional bonus material. Two Battin songs from his 1981 release on the Italian Appaloosa label have been added, »Willow in the Wind« and »China Moon« with the late, great Sneaky Pete Kleinow on pedal steel. At the end of the last song, there is a hidden track from Skip's rehearsals for the album with Clarence White on guitar. It is brief and very rough but it was was recorded just a few days before Clarence's untimely death, his last recordings in any form. To further enhance this release, there is also a bonus MPEG video clip on the disc (accessed by PC or MAC computer only) of a rare 1965 solo appearance of Skip on a local L.A. TV teenage dance party show! With a 12-string guitar in his hand and sporting an Elvis hairdo, Skip lip syncs his latest 45 single!